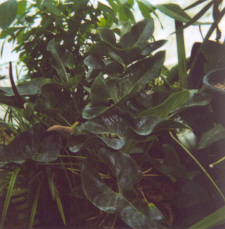 Anthurium andicola Liebm.,Vidensk. Meddel. Dansk Naturjhist. Foren. Kjobenhavn 1: 22. 1849. Etymology: Not known. The specific epithat means 'of the Andes', but this species occurs only in Mexico. Distribution: An endemic of Mexico. Type Locale: The type specimen was collected on the slopes of Volcan Orizaba, in central Veracruz, Mexico. Description: Epiphytic or epilithic (growing on or amongst rocks); stems, less than 20 cm long with thick descending roots and short internodes; leaves with petioles erect and spreading, blade dark green with posterior lobes which can vary from clone to clone, many clones have leaves which are almost funnel shaped in their presentation, inflorescence, erect, shorter than or equal to the leaves, spathe, narrowly ovate to ovate-lanceolate, green, spadix, green and tinged purple to various degrees, berries, orange with 2 large seeds ( 9mm x 5mm) per berry. Notes: Anth. andicola is a highly variable species and consequently has many synonyms. Variations in general leaf shape, size of leaves, amount of waxy bloom present, and variations in the upward contortions of the leaf lobes are all present in this species. Of easy culture, you can often find this species being sold as Anth. macdougallii.